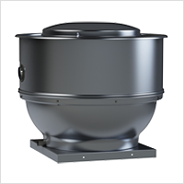 STXD, STXDe and STXDe-RHUL | S&P Canada Ventilation Products, Inc. Isolation of the motor from the air stream and the high velocity air discharge make the STXD ideally suited for the removal of dirty, contaminated and/or high temperature air from buildings and manufacturing plants. Typical applications include restaurant hoods and similar kitchen exhaust ventilation, fume and smoke removal, laboratory fume hood exhaust and chemical process exhaust.